Stop puttering around the pottery wheel with traditional clays, and instead start sculpting these no-bake, no-fuss DIY creations using air-dry clay. Unlike its pricier, high-maintenance counterpart, polymer clay, air-dry clay requires neither baking nor extensive handling. Time is all you need to dry your designs to polished perfection! 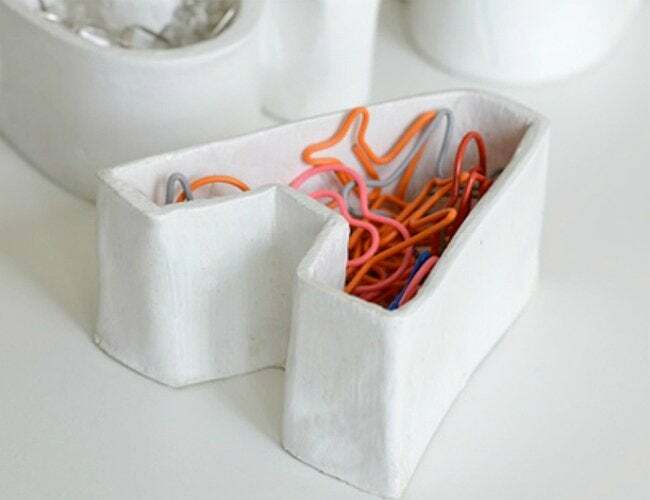 From decorative dishes in the dining room to desktop organizers for the home office, the options for air-dry clay are endless. It’s almost trickier to decide upon a design than it is to shape up this super-simple material. Get inspired with five of our favorite ways to mold and make with this flexible medium. Occupying that vague zone between schoolwork and crafts, colored pencils often get lost in a labyrinth of desks, drawers, and cabinets. 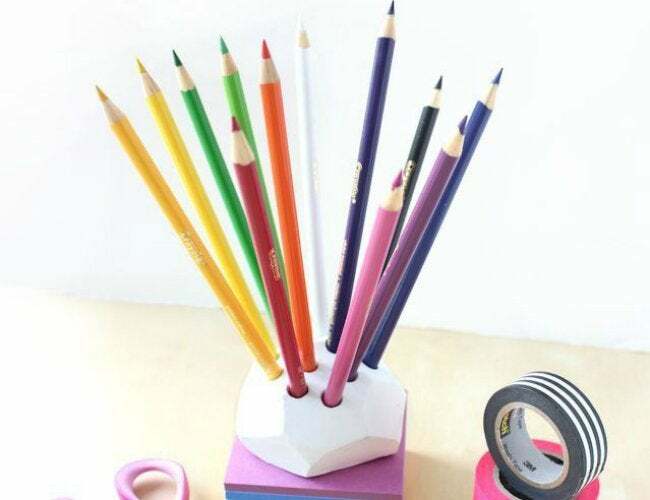 Build a home for these industrious instruments with your own version of this handmade pencil stand by Lines Across. Here, air-dry clay shaped into a dome can take the impression of every pencil you have in stock. Form holes by twisting each writing implement into the clay. When you’re done, remove the pencils and leave your creation to dry overnight. The next day, you can use a clay knife, box cutter, or kitchen knife to sculpt the edges to form a more riveting, geometric receptacle. You don’t have to revisit ancient Mesopotamia to bring ornate earthenware pottery into your home. These decorative clay dishes made by Urban Comfort put a modern twist on Neolithic pottery. Roll out some fresh air-dry clay on a clay mat, and lay an evergreen branch on top. 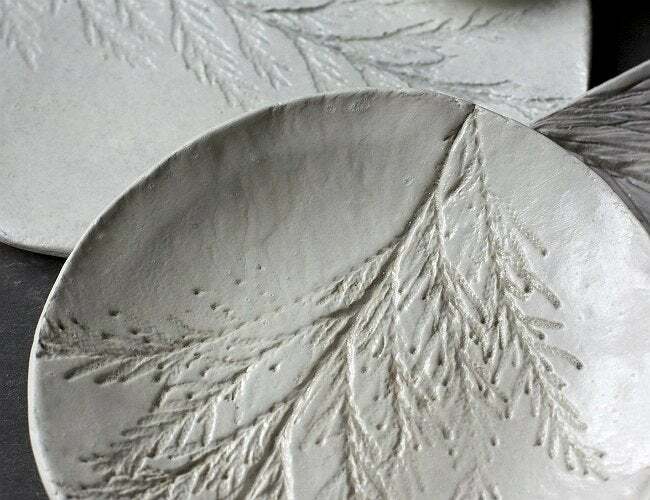 Place an acrylic sheet over the branch, and roll over it with an acrylic roller to create the imprint of the needles. Using a foam brush, glaze the dish with putty, weathered paint, and a glazing medium to leave an evergreen impression on your guests. These alphabet containers get an A for effortlessness. To create custom lettered storage like this one from Willowday, press alphabet cookie cutters into rolled-out clay, and cut out side strips from the excess. Fit these strips around the edge of the letter while pinching the sides to the base. (A knife or other tool comes in handy here.) Dipping your fingers and the knife into water can help you smooth any seams. After drying and sanding the container, paint it in complementary colors, and you’ll receive endless compliments. 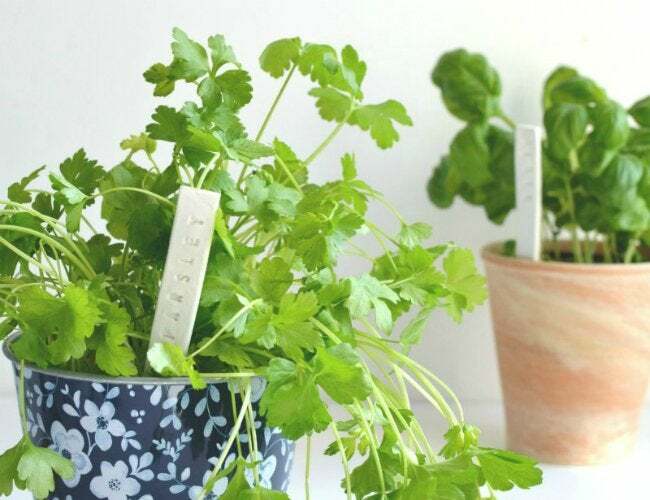 Whether you have a green thumb or you can’t tell parsley from parsnips, these DIY plant labels will help you do away with mistaken identities in your indoor or outdoor nursery with little more than leftover air-dry clay. Following instructions from the DIY site Burkatron, roll the clay flat and then use a craft knife to cut out long, rectangular stakes that you can sink into the soil of a planter. Using alphabet stamps, imprint the appropriate plant names onto each stake, and then dry and seal the deal with waterproof spray sealant. You might never guess by looking at them that these polished metallic drawer knobs from Delineate Your Dwelling are actually cover-ups made from humble air-dry clay. Start by rolling the clay into balls and fitting each one over a freestanding knob until it’s covered by the clay. After partially drying the clay knobs, carve them with a butter knife to create eye-catching, geometric edges. 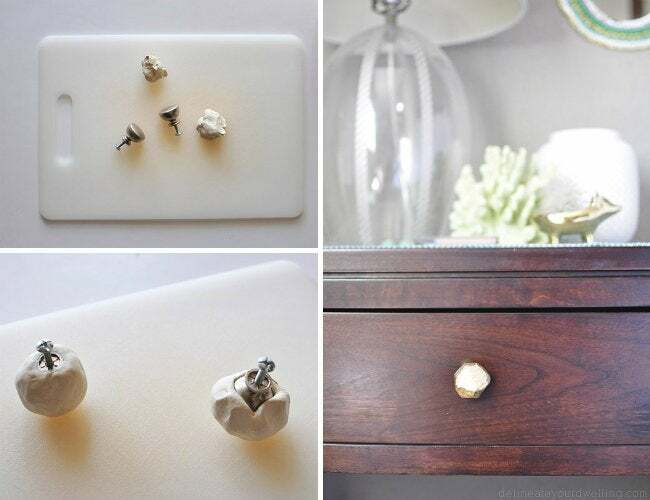 Follow up with two coats of gold spray paint—or any metallic you favor, for that matter—and install the knobs on nightstands, dressers, or wardrobes to really make them shine.